I'm often amazed at how few marketers utilize Google Analytics. I frequently hear people say that it seems a little too overwhelming or even a little bit scary. If you feel that way, you're not alone! The good news is that it actually is very easy to set up a few simple reports that will give you TONS of useful information about your web site and your online marketing efforts. Do you know who's visiting your web site? This report will show you how many of your users are new visitors versus returning users, where they are from, what language they speak, what browser and operating system they use and much more. Everyone should know this basic information about their site's visitors, and this report is really easy to set up and monitor on an ongoing basis. Log into Google Analytics, then click on Audience > Overview in the left menu or use our free tutorial to set up this report. Do you have any idea how much of your site's traffic comes from paid search, referrals, direct visits or organic search? How about whether Facebook, Twitter, Google, email and social media brings the users who are most engaged with your content? The Sources/Medium report is an absolute must for any modern marketer, and you should be reviewing this report at LEAST once per week. Daily would be even better. Knowing this critical data will allow you to stop wasting your time and money on marketing tactics that aren't working, and double-down on the ones that are. Go to Acquisition > All Traffic > Source/Medium or use our free tutorial to set up this report. What was the most popular page on your web site last week? Last month? Last year? If you don't know, you're not alone...very few marketers take the time to create this report, but it's actually one of the easiest and most useful reports to create. You can get all sorts of actionable insight out of this report, including which pages users are viewing the most, which ones are getting the least amount of traffic and bounces, and what topics are really resonating with your audience. To set up this report, go to Behavior > Site Content > All Pages or follow along with our free instructions. Need help setting up these reports? Contact us today and we can get them set up within 2-3 business days, then you'll get them automatically delivered to your inbox on a weekly basis. Want to set them up yourself? Download our free tutorial with detailed instructions about how to set them up. P.S. Stressed out because you don't even know how to use Google Analytics or because your marketing tasks aren't getting done? 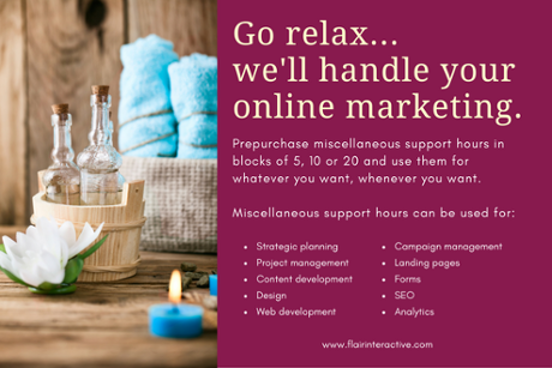 Relax and get help this week with our pay-as-you-go marketing support package!